I am obsessed with Mexican food. Seriously want to eat it everyday. Lately Matt and I have gotten into chopped salads. For awhile we were making our Greek chopped salad once a week with Shrimp and decided to switch it up with this salad. We chop everything up and then toss in in a big bowl. After it is tossed we add ground beef to the top. Honestly this salad is amaze without the ground beef, but you know my man needs meat so we add meat. 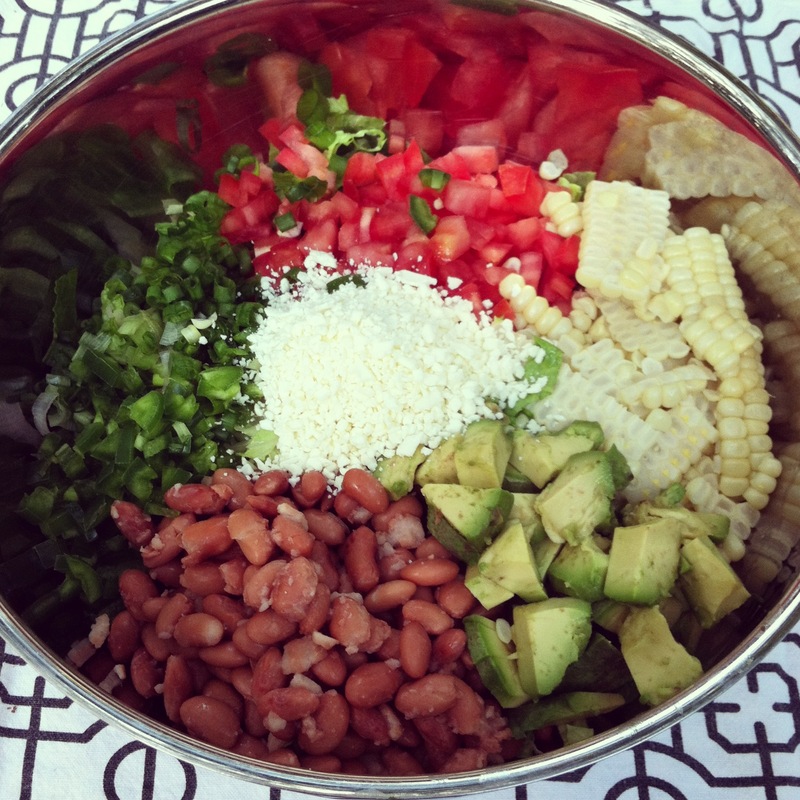 We add salsa to our bowls and mix before serving and use that as our dressing, but you could use any dressing you like. We gobble this salad up once a week and best part it is not too bad for you. It is filled with so many veggies and protein that are healthy. Place finely chopped lettuce in bowl and top with next 7 ingredients. Toss together. Cook ground beef, drain and add taco seasoning + water. 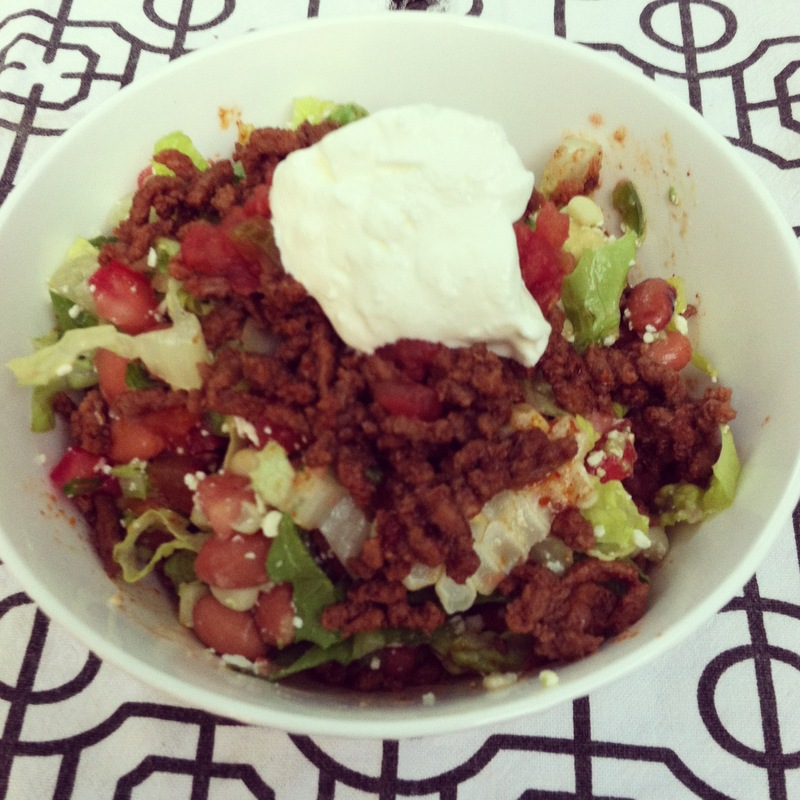 Serve salad in bowl mixed with salsa and topped with ground beef and sour cream. Looks so good and healthy! Yum, love a chopped salad! That salad looks amazing! Will definitely have to try it! Thanks for sharing. I am drooling over here!! This looks amazing. I love chopped salads. We always eat mexican food at Santi's, but I really do think homemade mexican food is so much better. Will have to try this! We have been on a chopped salad kick lately, too, so this will definitely be added to the rotation! Thanks for sharing! What a perfect summer salad! Thank you for sharing :) Can't wait to try it out. Yum!!! Mexican food is always good but after becoming pregnant, I could literally eat it every single day! That looks so refreshing and healthy. Thanks for the inspiration! this truly looks absolutely amazing - I've been trying to turn taco night into taco salad night and this looks like just the thing to do it with! looks delish and I love the new layout! I love all your recipes. They are the only ones this "bad cook" is brave enough to try. Umm this salad is amazing!! It has everything that I love and you can never go wrong with Mexican! !